In the United States, there are only three medications used to treat alcoholism that are approved by the U.S. Food and Drug Administration. These drugs help to treat alcohol abuse and dependence. None of these drugs can or are prescribed to individuals who are still drinking; they are only prescribed to those who have stopped and are trying to abstain from using the substance. All three of these substances produce a different effect when taking them. What is Disulfiram or Antabuse? 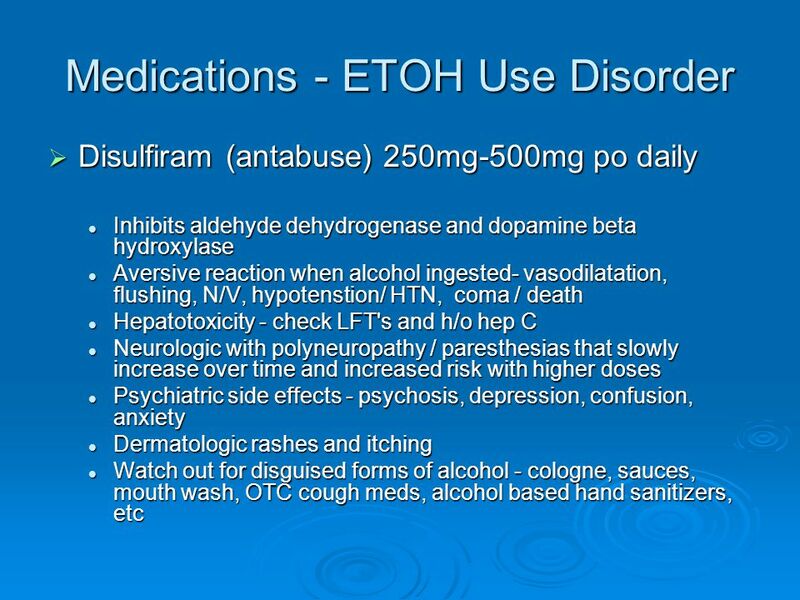 This medication was the first to be approved for the treatment of alcohol dependence and abuse. The medication works by causing a severe adverse reaction when someone consumes alcohol. Discovered in the 1920s, it blocks the processing of alcohol in the body and causing an allergic reaction that makes the user feel sick. Antabuse is most successful when it is used in conjunction with support and counseling too. The drug also has been studies in order to treat cocaine abuse as it is successful in preventing the breakdown of dopamine which results in the increased blood pressure and anxiety. A nine-year study of chronic European alcoholics revealed that more than 50% of those studied refrained from drinking when using this medication for a long period of time. There is no tolerance to the drug and the longer it is taken, the stronger it effects are. What is Acamprosate or Campral? This medication is the most recently-approved drug for treating alcoholism. Approved in 2004, Acamprosate (Campral) drug had previously been used in Europe with success. It works by reducing the body’s physical distress and discomfort which alcoholics tend to experience after quitting. It achieves this by stabilizing the brain’s chemical balance. The drug is well tolerable and has minimal side effects, which makes it a popular choice for doctors to prescribe. Those with kidney or liver problems should not take this medication. It is time-released and provides results throughout the day, not just in one dose. Those who are pregnant, have kidney disease, depression, suicidal thoughts or an allergic reaction to many foods should not take Campral. During FDA clinical trials, the drug was three times more effective than a placebo drug in maintaining abstinence from drinking alcohol. This extended release medication works by blocking the high the brain feels when people drink or take opioids such as cocaine or heroin. The drug was first approved in 1994. 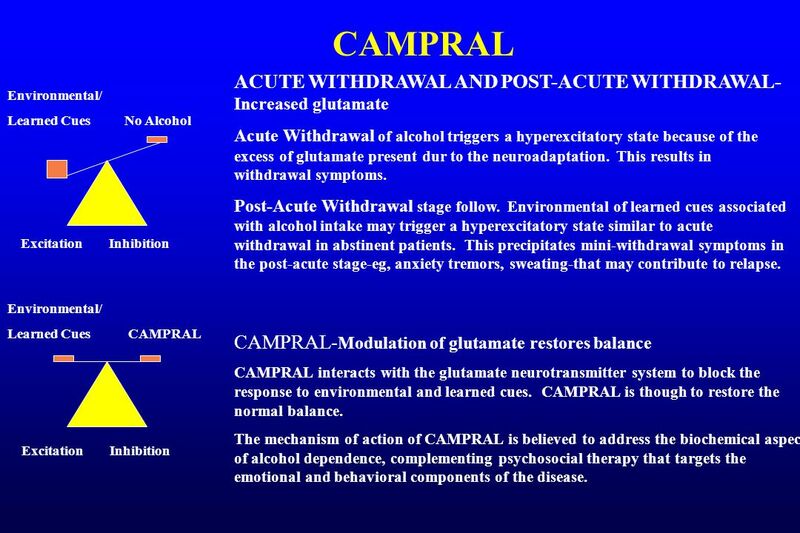 Many studies have confirmed that it reduces the frequency that prescribers relapse. This nonnarcotic and nonaddictive medication works best for patients who also are embarking on counseling and other support programs while taking it. The drug will also help relieve any withdrawal symptoms a user may have. 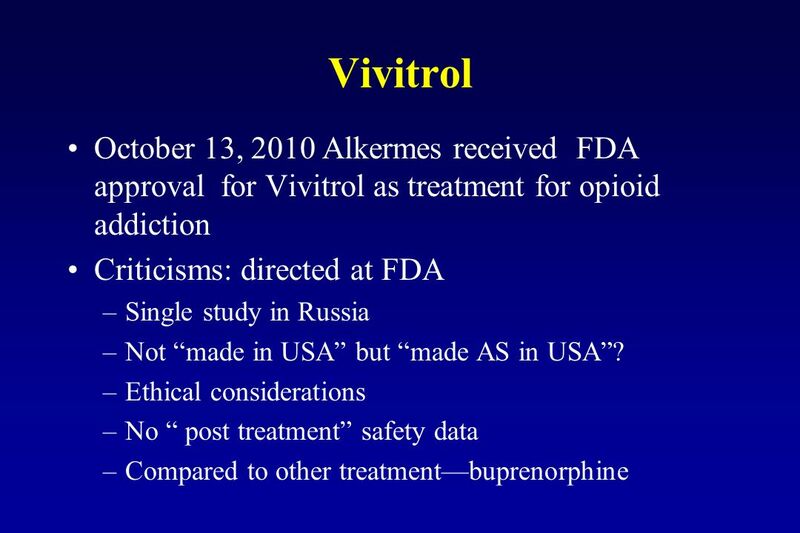 Also known as Vivitrol, the drug can also be prescribed in a prescription injectable medication once a month. This medication is only effective if the user stops drinking and refrains from any drugs.